The first – and potentially only – forum between Ald. 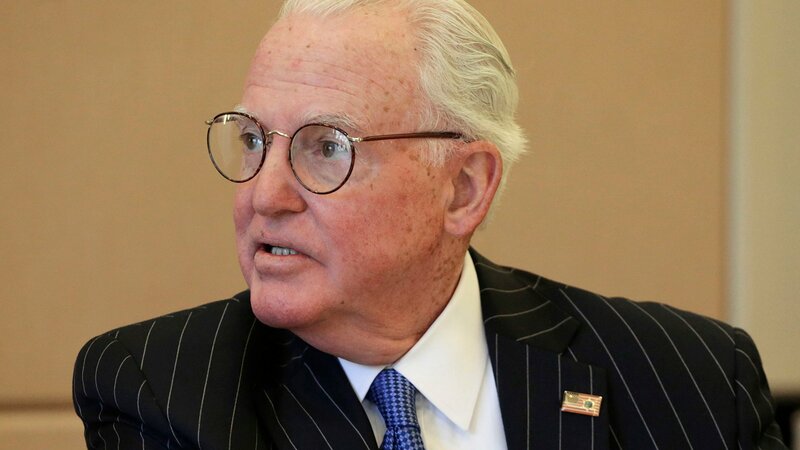 Ed Burke and his two challengers in the race for the 14th Ward came and went with a single straightforward reference to the criminal charges he’s facing. And it didn’t come from Burke. Burke closed without comment on the news, which has only spiraled since agents raided Burke’s offices in November and since he was charged with attempted extortion in early January; just Wednesday morning the Chicago Sun-Times reported that retiring 25th Ward Ald. Danny Solis secretly recorded Burke for the FBI. Instead, Burke told the crowd he hoped to be re-elected based on his record and his accomplishments, and he complimented his challengers for being well-spoken and well-versed on the issues. Burke faced no direct questions about the allegation he attempted to shake down a fast-food magnate. Prosecutors say Burke used his City Council position to try to prevent renovations at a local Burger King until the restaurant’s wealthy, Texas-based owner agreed to hire Burke’s private law firm for Chicago-area property tax appeals work. The sole straightforward reference to Burke’s criminal legal troubles came when challenger Jaime Guzman, an attorney, used his closing statement to briefly go after Burke. Guzman went on to attack the other challenger, Tanya Patiño, who has U.S. Rep. Chuy Garcia’s endorsement. Patiño is dating state Rep. Aaron Ortiz, who also had Garcia’s help in his successful campaign to best Burke’s brother, longtime state Rep. Dan Burke, in November’s statewide elections. “Ms. Patiño is taking part in a process where we’re being asking to go from one system of cronyism to another system of cronyism,” Guzman said, in that residents are being asked to replace an alderman who has a state representative brother with an alderman who has a state representative boyfriend. One man cheered: “Call it out!” But there were also audible boos. Patiño admonished Guzman in her closing statement, saying she has dominated the soccer field, engineering classes and her job as a civil engineer for People’s Gas. Earlier in the forum, Patiño called Burke “out of touch with the community” for having voted in 2012 to close six of the city’s 12 mental health clinics. Guzman said Chicago should raise revenue to fill holes in mental health needs through “novel ideas” like a real estate transfer tax when homes worth over $1 million are sold. “Luckily the only house that’s going to be affected (in the 14th Ward) is his house,” Guzman said, pointing at Burke. Burke owns an expansive brick home, accessible through a locked gate, that dwarfs neighboring houses. “But I’m not selling,” Burke said, with a grin and a laugh. “At least not yet,” Guzman returned. In response to a question about a language barrier in the district, both Guzman and Patiño critized Burke for not having Spanish-speaking staff in his ward office. “My entire office staff is bilingual,” he said. He didn’t address the question otherwise. What should be done to reduce violence? Burke highlighted his sponsorship of a buyback program he said took 500 guns off the streets and the city’s installation of gunshot detection systems, and he called for “more cops.” He also said he successfully got a hotel on Cicero Avenue demolished that had “been a source of problems” for years. Patiño told a story about a child she met while campaigning who’d been excited to apply for the government-backed youth program “One Summer Chicago,” only to be rejected for lack of space. He called for street intervention programs, and passing a $15 minimum wage that people can live on. He also said the Cook County Assessor’s Office, newly fronted by Fritz Kaegi after Joseph Berrios lost in November, should revise the system for assessing real estate in a way that doesn’t favor higher-valued homes. “We know that to avoid poverty we need to give people opportunities to create wealth, and it starts with their own home,” Guzman said. Burke, wearing his trademark pinstripe suit and fedora, ignored the reporters who swarmed him as he entered and left the forum, asking for a response to the Solis wiretap and the admission from mayoral candidate and Cook County Board President Toni Preckwinkle that she spoke with Burke before hiring his son, Edward Burke Jr., for a county job. Although Burke lost his longtime city-funded police detail when he gave up his chairmanship of the finance committee in the fallout over the criminal charges, a bodyguard remained by Burke’s side, save for when he stood at the onstage podium between Guzman and Patiño. The election is Feb. 26. Should none of the three candidates garner more than 50 percent of the vote, the top two will enter a run-off in March. Though several other forums are scheduled, it’s unclear whether Burke will commit to attending. His sizable campaign accounts, in which he’s amassed some $12 million over a 50-year political career, dwarf those of Guzman and Patiño.